A template from which one can more easily build a standards-aware website. It is in the words of one of its creators Paul Irish “a good starting template of HTML and CSS and a folder structure that works… Baked into it is years of best practices from front-end development professionals.” Since 2010, it’s been polished and iterated upon by hundreds of developers. A Google search for “boilerplate” yields html5boilerplate.com as the first search result over an actual boiler plate. .htaccess is the default config file for an Apache web server, humans.txt is for listing team members and technologies used, and robots.txt is for pages that should be hidden from search engines. crossdomain.xml is a template for working with cross-domain requests and favicon.ico and the Apple touch icon should be replaced with your own so the user sees a customized icon when he or she bookmarks the site. 404.html is the default “Not Found” page and index.html the default load page. Apparently, if the charset isn’t declared within the first 512 bytes of your HTML document, your site is vulnerable to malicious code and hijacking! 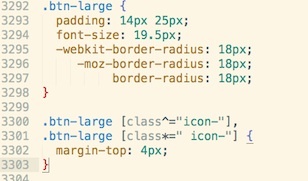 Keep those styles in line with normalize.css! “Normalize.css makes browsers render all elements more consistently and in line with modern standards. It precisely targets only the styles that need normalizing.” How fascist. 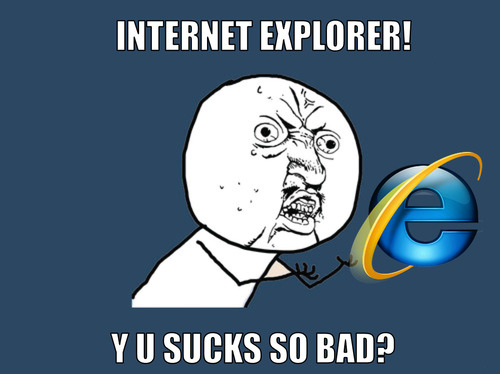 <p class="browsehappy">You are using an <strong>outdated</strong> browser. Bow down to almighty Google, sourcer of jQuery. Actually, you should use Google CDN (Content Delivery Network) because the visitor’s browser will likely have a cached version of jQuery from their site… and Google’s servers are probably way faster than yours anyway. So yes, bow down to Lord Google. * These selection rule sets have to be separate. Friends don’t let friends float divs non-clearfixed. What are print styles? Print styles are styles for “printing”, which means the transfer of ink to “paper”. Paper is a dried, flat-sheet made from the fibrous pulp of wood, a material that hit its peak popularity at the end of the 20th century. Who prints webpages, seriously? Get a tablet, people! Apologies for that last one. 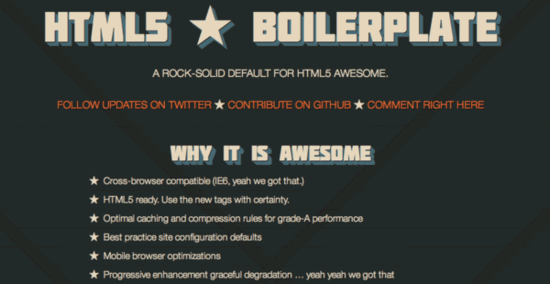 Will the real HTML5 boilerplate please stand up? This guy, Harry Roberts, is into minimalism and questioning assumptions, which is always good. He considers the original to be bloatware, basically. Now you know why HTML5 Boilerplate exists. It is a beacon of hope in this hostile world of way too many options for browsing. At least with the boilerplate, you have a few crowd-sourced signposts pointing the way. I must say, front-end development has really come a long way since the good ol’ GeoCities days. So tell me, when will people stop confusing the roles of web designer and web developer? I’ve never had to present in front of such a large group before. Generally, the larger the group, the more you might feel impostor syndrome, thinking “among these peers, I can’t possibly claim to be the expert.” But this time, I didn’t feel that at all. Here was a unique situation where I was presenting on something my team and I had created. Only we knew of the intricate workings of the app, the genesis of the idea, the struggle and breakthroughs, and (at times) even the doubt of its success and viability. We are the experts on all of that. No one knows more about that than us. We were telling our own story from our point of view. We had lived it and it was ours. 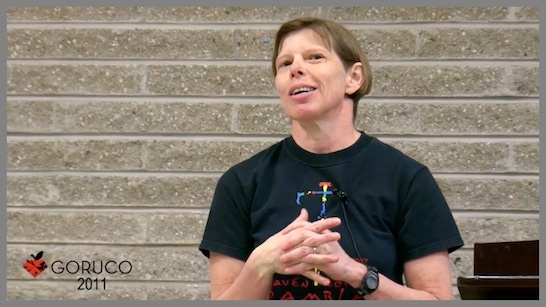 Sandi Metz gave a brilliant talk at The Flatiron School two months ago where she shared some of her experiences speaking and consulting in the tech field. She bravely acknowledged that even she had felt like an impostor at times, wondering if she was qualified to author a Ruby guide (Principles of Object Oriented Programing in Ruby) or to consult on a project and claim that things should be done as she recommended. For years, she even avoided giving talks altogether! You have to own your words and take ownership of your ideas. You have to know that you have a valuable point of view that not only is important for you to share, you must also share it bravely. Don’t step back on your own words. Inspect them, think deeply about them, and then present them like you are the expert. You owe that to your ideas. And it will be far more convincing. Rehearse, Reduce, Rehearse, Simplify, Rehearse! And Script! 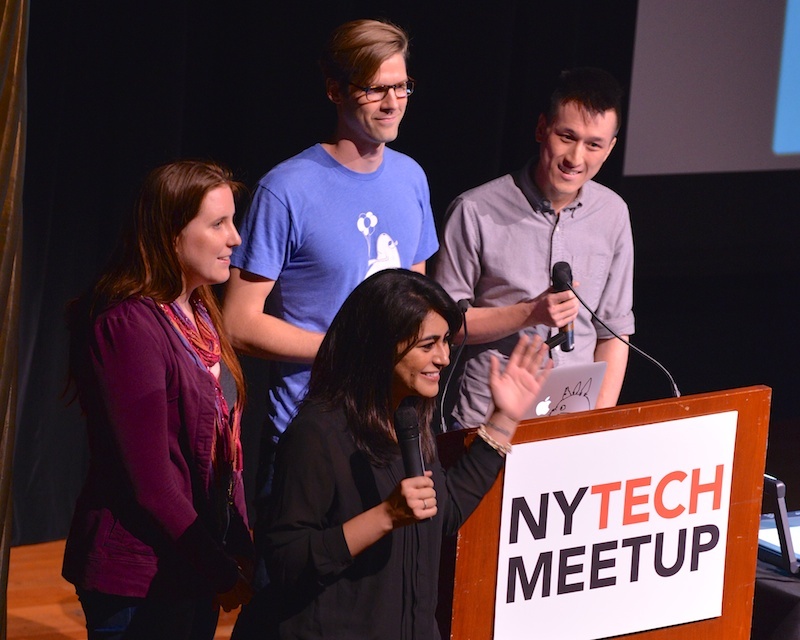 At NYTM, we would be given 5 minutes to talk about Bike With Friends. Our task would be to explain our app — all 4 of us on stage — in a way that was not only clear, concise, and simple, but also conveyed our excitement about the app. The real challenge was not that we were speaking to a large audience, it would be getting our message across in that condensed format. I knew there was a real possibility of us not meeting that mark. I don’t have to say how poorly our first run-through went the Sunday prior. Each trying to say too much in our individual minute, we reiterated each other’s points, choked on the things we wanted to say, and overall, made an oratorical mess. In a way it was good how bad it was. It was clear we wouldn’t be able to “wing” the presentation the same way we had at our NYC on Rails Meetup at school or at Civic Hack Night/#BetaNYC. By “wing”, I mean “loosely organized” with “things we want to talk about”. We would have to script. 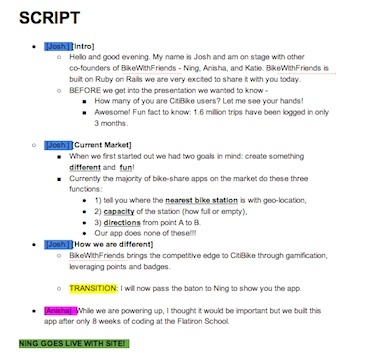 You can read my teammate Anisha’s blog entry on scripting our talk for NYTM (she wrote it before the talk took place). In it she notes how scripting was a challenge for her. She felt it prevented her from expressing her spontaneity and fun personality, limiting her ability to feel out her audience. I agree how scripting limits you. But the limiting is entirely appropriate for this kind of talk. When you have 4 people on stage trying to each get their ideas in, and you only have 5 minutes, you must script! There are perhaps many reasons to script, but the most important reason by far is so you condense your thoughts into real words and sentences. Yes, you do want to have the freedom to phrase things how you wish on presentation day. But no matter what, you have to say it some way, and better to hash those options out on the page first. To clarify: By script I don’t mean just an outline with bullet points. I mean actual, fully-worded sentences like the ones you might see on a teleprompter for a stump speech. Yes, there is an off chance that you may come up with that brilliant line that most expresses what you want to convey on the spot that day. But there is just as likely a chance you try to go off the cuff and say the exact wrong thing (or just confuse the hell out of your audience). My team quickly saw the value of a script each time we rehearsed. It became very clear that there were certain versions of our explanation that were more — to borrow a Ruby programmer’s phrase — expressive, meaning concise, what you actually want to say, and anyone seeing it knows exactly what it is. Through this slow process of making these decisions jointly, our talk was distilled into a better version of itself after every rehearsal. And since we all knew what each person wanted to say, we could help them with that process and let them do it in their own words. What about the downsides of scripting and, subsequently, rehearsing? That our personalities would die through the process, our jokes would be canned, and we would seem totally fake? I’ll hold off on answering that for a minute. Our next issue in rehearsing the script was that we were still way over. Even with a revised script, it was too long (7+ minutes), and we were still stumbling over certain sections. Some badges were just too difficult to explain (like the Biker Gang badge) and some transitions (“I’ll hand the baton over to Josh now to explain further steps…”) were flow-killing. With the script, we achieved last minute efficiencies up till even 30 minutes before the event started because we had something we could all look at and edit. We were never without a roadmap, even as the enormity of the task at hand loomed ever closer. Rehearsed (to Death), and Ready to Crush It! By the time of the event, we were all sick of our script. None of it seemed funny to any of us. Our rehearsals had been earnest, but definitely lacking in personality. Each of us could mouth the words of the other teammates as they were saying their lines since it was mostly verbatim out of the script. Had we drilled enough, or too much? Would we be understood? Would we be able the convey the fun experience that is BikeWithFriends and the passion we put into building it? Maybe the title of this section is too negative. Because the talk actually went over better than any of us could have dreamed. 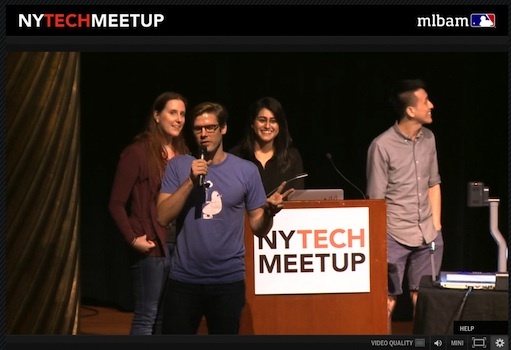 All of us on the team were more than just a little surprised, we were genuinely shocked we got so many laughs and such a warm response from the NYTM crowd. They are an awesome bunch, by the way! We felt very comfortable on stage. The script was on the podium, flanked by the presentation laptop, but we didn’t even need it there. The amount of work that went into the script paid off completely. None of us were lost at all during the presentation. We were easily able to keep the flow of the talk going, hand off the mics to each other, and navigate through the app with complete ease. Though nothing happening on the stage was extemporaneous, with the energy in the room — and our own adrenaline and hearts racing — we could feel our words connecting with the crowd as if they were spontaneous. After the first laughs, right after Josh said “our app does none of these” and waved his hand horizontally, we knew we were going to be fine. 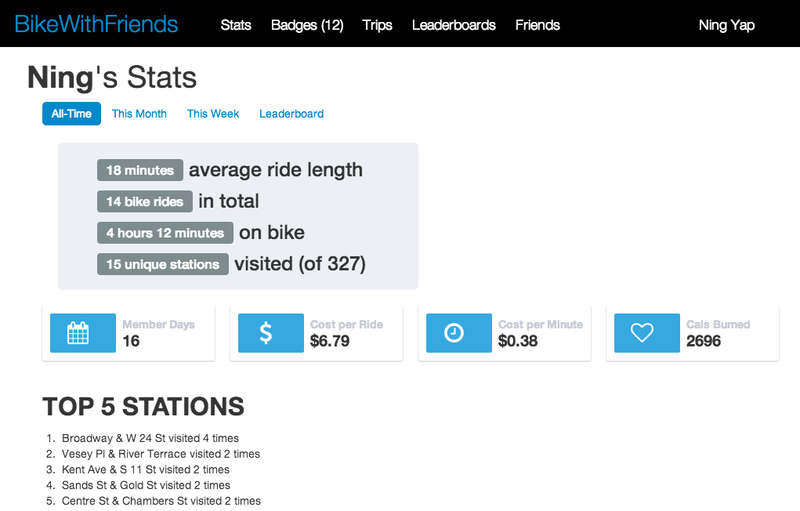 I know this blog entry has said nothing about our app, BikeWithFriends. Yes, the topic which you choose to speak about needs to be exciting on its own merit. But actually presenting something provides its own specific challenges. Just like how you might approach a coding problem, breaking down and controlling for as many variables as you can, we approached this presentation in the same manner. The most obvious unknown was probably “how do we handle our nerves?” Would we break down in front of the massive audience at Skirball, unable to form even one coherent sentence? We couldn’t let that be a possibility. Instead, we wrote a code: the script. The rehearsals amounted to refactoring that code to guarantee that it ran smoothly and efficiently. Even if we couldn’t control for the nerves, we prepared and “coded” for all the parts we could control: what we would say and how we would say it. Once we were on stage, I remember stumbling on some words here and there. But that didn’t matter too much. The nerves didn’t knock me off my game because — channeling Sandi Metz — I was the expert on the topic, I had prepared and rehearsed exactly what I was going to say and knew exactly why I wanted to say it. The event really flew by for us. We had less than a week to prepare for the talk, but all the pieces somehow managed to fall into place. It certainly helped that we had already presented our project twice before the event. I’m sure I’ll have more thoughts about how to structure a talk when I have to do it again, but I am glad that it’s over. Perhaps the final side note I have is that once you are onstage, near the mics, be careful what you say. Especially if there is a livestream being captured for the event. In our excitement, one of my teammates may have used some colorful language, exclaiming “We’re going to #$%@ crush this!” Oops. But, in the end, I’m so glad we did. The genesis of the app was really more an area of focus than anything specific. After completing Ashley William’s CitiBike excercise for class at The Flatiron School, I really wanted to play more with CitiBike JSON data and maps. I discussed with my group my hope to create some rough proof of concepts about ideas we could turn into projects. I turned to my old, trusted friend Google to research what was already out there. There were a good amount of sites visualizing macro data regarding available bikes at all the stations, which was pretty cool, but I knew early on it wasn’t worth trying to replicate that sort of implementation. The available bikes/docks data is available to everyone, and I saw multiple sites using that data in the same ways. 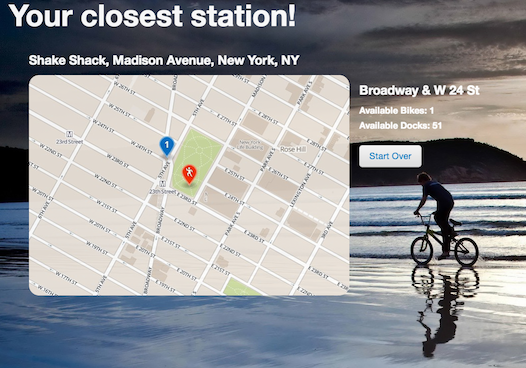 Originally I wanted to make an app that could text/email you if your “home” CitiBike station as out of bikes. It would also allow you to see the viability of a commute based on collected data about your start and end stations and a specified time of departure. It became apparent this would be a data intensive task, though doable. Another focus for me was playing with map features as I think having a visual component to interact with is always fun and adds interest. The first POC involved getting bike directions to show up between two selected stations. 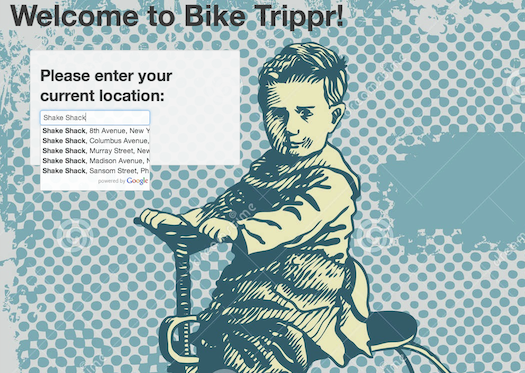 The second POC gave you the ability to type in any address and it would show you the closest bike station to you. 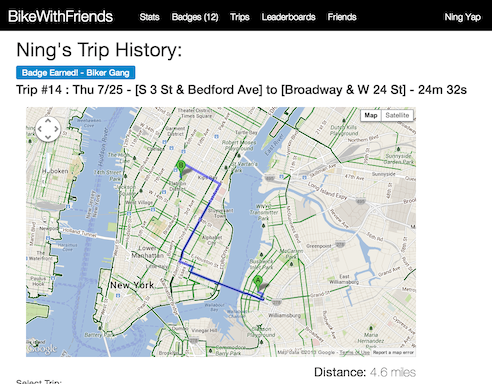 The proof of concepts were for the most part discarded in the final concept that became BikeWithFriends, but the time spent and knowledge gained through building those two apps gave me a level of confidence about being able to work closely with CitiBike data and creating an interactive user experience. 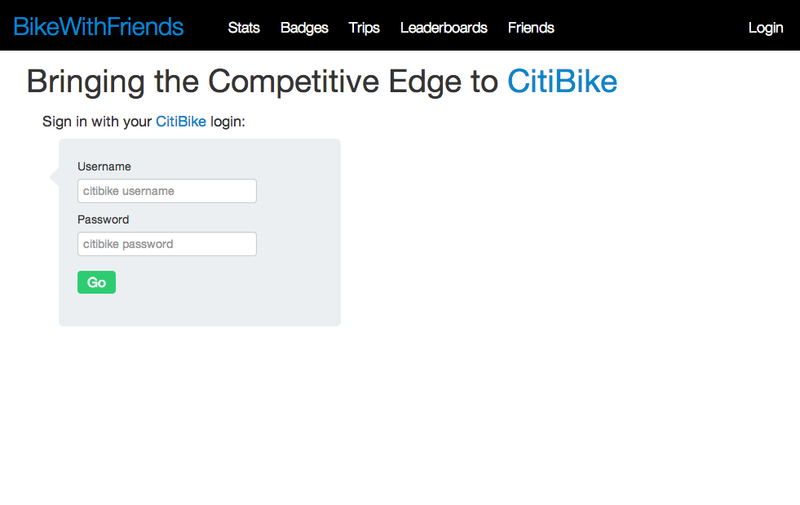 In the meantime, I had signed up for a CitiBike membership and would receive a key by the end of the week. Just a day or two after the POCs were done, my team and a few other classmates were at Shake Shack waiting on line for burgers and shakes and through our discussions, we came up with new ideas for creating a better experience for users of our site: We would make CitiBiking into a sort of game, with leaderboards, the possibility of racing from one station to another station, and using CitiBike’s trip data to calculate durations of your trips and start and end stations, which would put you on a leaderboard. That idea quickly blossomed and matured. 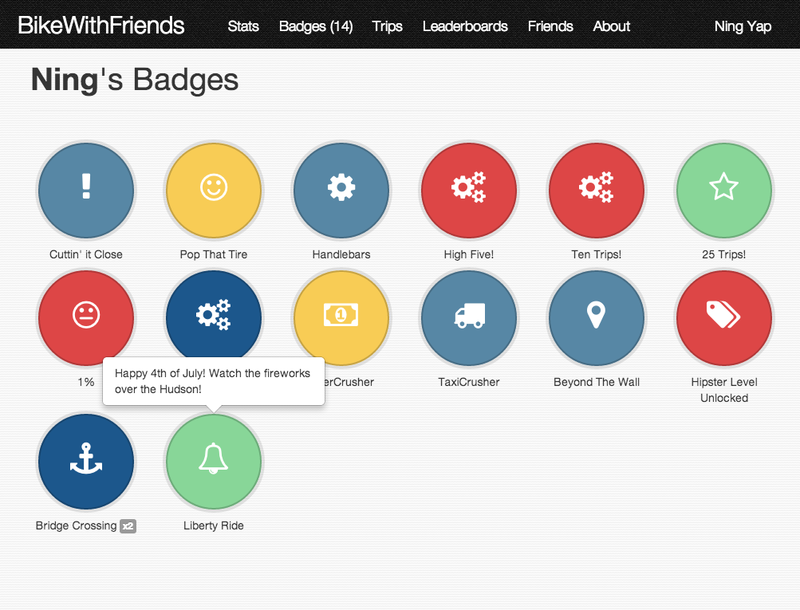 How about awarding badges for completing different kinds of trips and meeting certain game-like conditions? Badges for number of trips taken, stations visited, for crossing a bridge, or even for biking with someone else? We realized how cool this concept could be, but would we be able to transform it into code? 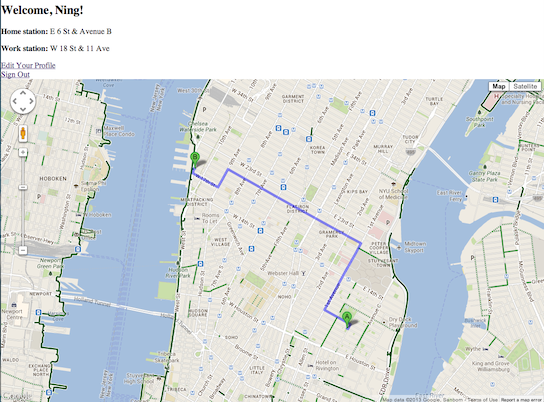 I spent my Sunday biking around Manhattan and to Williamsburg and Brooklyn to generate some data for our app. BTW, generating data for your app has to be one of my most favorite pastimes. I’m learning how much I love good, real seed data as it provides you with a much, much better picture of what your app should be and how it might be used. Biking around the city and across the bridges gave me an idea of getting a badge for crosssing the bridge. Biking along the south tip of Manhattan gave me an idea to award a badge for visiting the stations that give you a view of the Statue of Liberty. Or how about biking on holidays? The experience of seeing something come from nothing has been amazing. And to see that passion recognized by being selected as Hack of the Month for the August NY Tech Meetup is unbelievably rewarding. 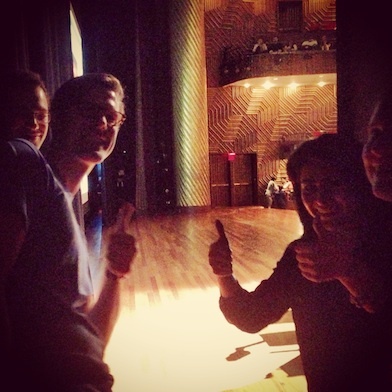 We will present on August 7th at NYU Skirball Performing Arts Center for an audience of 1,000+. We’re stoked! Look for the follow-up blog post! Play with the completed UI at recipeui.herokuapp.com! The battle between front-end and back-end continues to be waged. But who cares about that? Let’s make a beautiful UI because it makes us happy! selects the element, by element id being quite common and efficient. will write HTML code into your page directly. hides an element by adding the CSS display property. Also, let’s use FlatUI, a Boostrap-wrapped theme. Download here! Idea: The pantry contains all ingredients available to the chef to create her recipe. If she doesn’t have the ingredients handy, she must go shopping at the local marketplace. 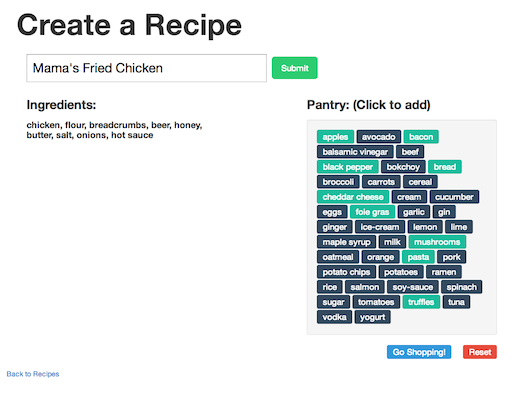 UI Concept: How about clicking on visual representations of ingredients in the pantry and “popping” them into the recipe list? Sounds awesome right? There are two actions associated with a click. It must hide the pantry item and append to the recipe. If you don’t hide the pantry item, recipes could have duplicate items. Use ERb each loops to loop through the entire ingredient list and create a JQuery click action for each. A reset action “resets” the recipe and refresh the pantry. 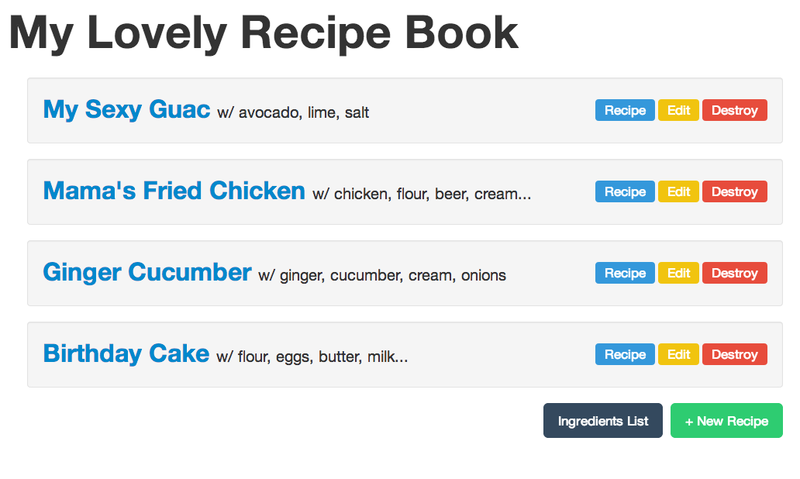 A submit action writes the finished recipe to the hidden form field on the page. Pass the render function the js.erb partial and a local variable encapsulating all your ingredients. And it’s just that simple! Make the necessary adjustments to your Edit view, i.e. hide the elements that are already in the recipe. Give it some flair by hiding the disposal until the user tries to dispose. Fade out if the user changes his mind and cancels. Check out the repo for how-to. Switch Up. 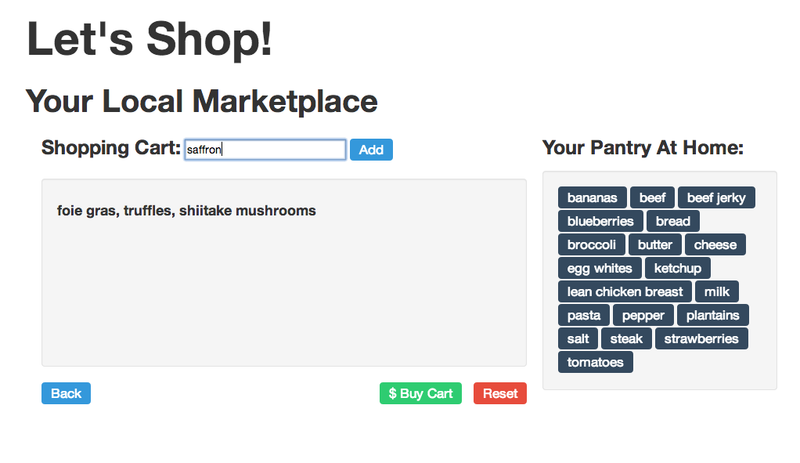 Make a Shopping Cart Text Field! Same principles here. Clicking add should pop the typed text into the cart. It takes just a few different lines of code. When you “submit” the form (text field) by clicking the “add” button, it will try to redirect you to a new page. 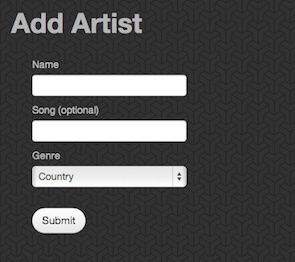 Kill that action by putting this code in the “action” attribute of the form. Add some simple animation. Make the field shake if the user tries to add badly-formatted items. How about a cool feature to highlight the new items you just bought? Use the .updated_at method and subtract from Time.now. Make the colors of the buttons refer to their usage! How about smartly listing the ingredients in the main recipe window? 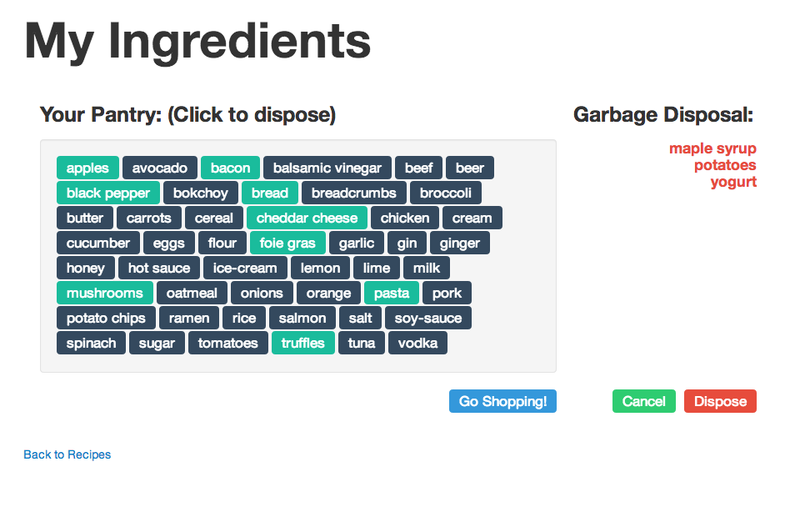 Show the first four ingredients and then append a “…” if there are more ingredients. With ERb, the world is your oyster recipe. Now go generate your own ERb.js UI! Visit Bootstrap and download the zip file. Unzip and copy the css, js and img folders into the ‘public’ folder of your Sinatra site directory. Edit your layout.erb to include bootstrap.css within the <head> tags. bootstrap.js goes within your <body> tags at the end. Note the positioning of <%= yield %> ERB tag which will take content from other ERB templates within your views directory. The file layout.erb is a convention of Sinatra that automatically becomes the default “layout” template of your site. This can be changed within your routes manually. Consider your nav bar, which will sit on top of every page that uses your default layout. Bootstrap makes it very easy to create drop down menus and also includes a search bar. Use ERB (each loops) to dynamically generate menu items! 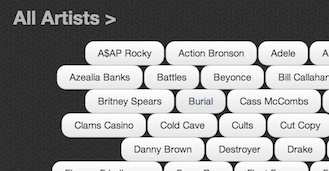 For example, in the Genres dropdown menu, the list of genres is dynamically calculated, as is the total number of songs in each category. Having a navigation bar means making decisions about your routes! Consider your “main” routes, or the ones that will be accessed most often. Try to make most content on the site accessible from within 3 clicks or so from the home page. Subtle Patterns has free “textured” backgrounds that can spruce up the look of your site. Add the texture files to your ‘public/img’ folder of your site and then add the appropriate css between your <head> tags of your layout.erb. 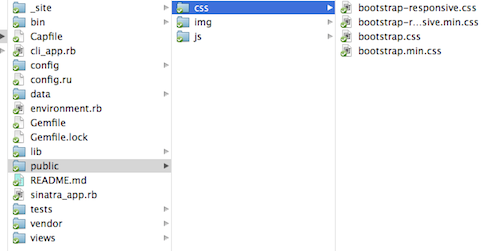 Don’t be afraid to edit Bootstrap’s CSS file to suit your needs. For example, I edited the “.btn” class to achieve rounder larger buttons to hold artists and songs. Refer to the Components section of the documentation for more tips and examples of included styles. Utilize “container” class and “span#” to take advantage of pre-configured grid/responsive design. Be aware of block elements and inline elements. 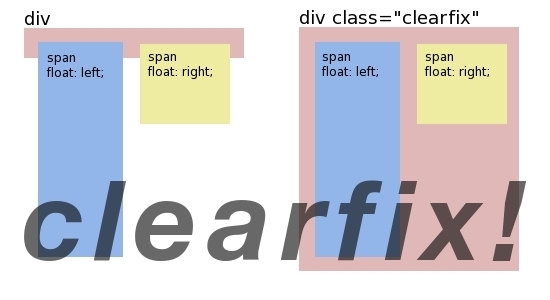 “Span” classes can collapse responsively as the window resizes. Achieve flow by having objects point to each other and organize them both visually and logically. Add/drop features are more advanced and are “hidden” away, drop buttons are given class of danger to highlight destructive nature. Ultimately, dynamic pages/data are more interesting, so if you’ve built robust Classes/Objects in your code, pull the data into the page with ERB and make your site feel alive! 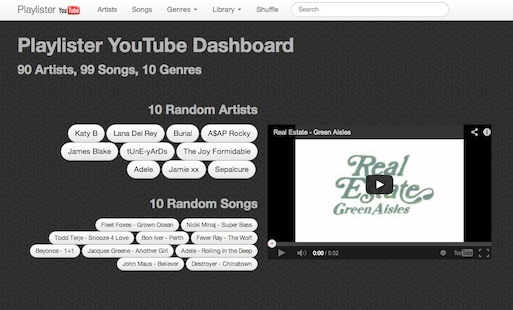 Checkout my repository here to see the results! So perousing speakerdeck.com for a class assignment alerted me to the fact that I’m not alone at all. See here and here. There are a good number of people interested in utilizing Ruby for game development. And where there is interest — I’m learning — there are always gems! The one I’ll be focusing on (and also using) is called ‘Gosu’. So my last game I tried to write, see my last post, was played in the command line, didn’t refresh, and had no sprites or fancy graphics. With gosu, I’ll be able to take advantage of real-time input from the player in the form of any keystroke (I’m thinking of a cool typing game!). It will be able to draw the window and then re-draw (I’m thinking of car-crashes and collisions and block-exploding animations). The Resource Manager allows for images and sprites (time to pay direct homage to my 8-bit and 16-bit past). The Game State Manager allows for win, loss, death, pause conditions (very much like real-life). self.caption = "Gosu Tutorial Game"
Not only that, there is even an option for adding sound, which is probably the icing on the cake, since I didn’t tell you this, but I actually studied music/sound production in college. Anyway, I recall this game called “Mario Teaches Typing” from the early 90s — back when it was possible to not know how to type (Mavis Beacon, anyone?). 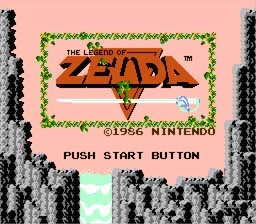 That game turned out to be pretty garbage, because speed typing to make Mario jump is horribly unsatisfying. But maybe we should take another look? 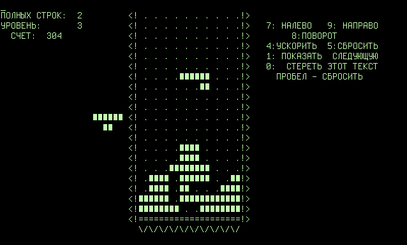 How about a game that teaches basic Ruby syntax. Can writing nested each loops be a fun game play mechanic? I’ll have an answer to that question in the next few weeks, hopefully. This “branch-world” idea quickly became preposterous as Git branches are not meant to be completely distinct entities, but rather different versions of a master branch and represent modest changes in files and structures. I realized I’d need a cleaner, more sensible approach. It became apparent that if I wanted to build a sensible game, I would need to actually study Git and understand how it should be used. I would have to acknowledge and draw upon Git’s power as a version control system and create a context to utilize that workflow. 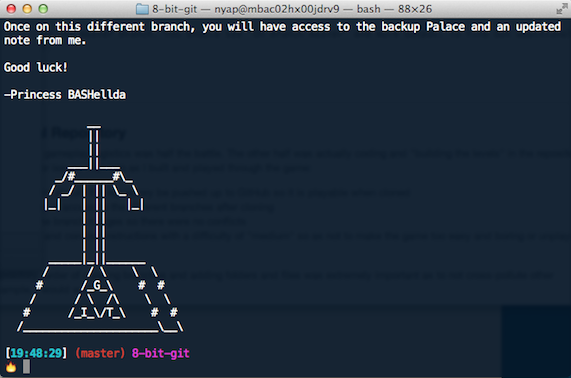 git commit -am "update files"
And to provide instructions to the player, I would have Princess BASHellda leave notes (in .txt format) to guide the player on what to do next. Ganon             => Prince of Darkness "BSOD"
Currently, you are on the master branch. You should see "On branch master"
on the master branch. Here’s what the palace “looks like” after the player merges from backup. 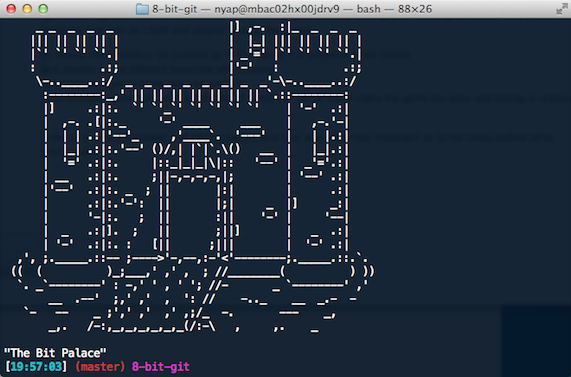 This is an ongoing project that will improve as I continue to learn and use git. I think I will build out different stages of the game to show the more advanced techniques of git that I don’t yet know. Stay tuned!